Nuremberg - Arms outstretched, fists clenched and grinning from ear to ear, Hiroshi Kiyotake soaked up the plaudits from his 1. FC Nürnberg team-mates, with left back Javier Pinola the first on hand to dish them out. Heading into the final minute of regulation time against Hertha Berlin, the Japanese midfielder had just sunk a fantastic free kick past visiting custodian Thomas Kraft and into the top corner of the net, salvaging der Club a point at the end of a pulsating encounter. "It would have been nice to beat Hertha, but we're up and running in the league," head coach Michael Wiesinger summarised on the back of his side's second successive 2-2 draw. The same result again would very likely go down just fine with Wiesinger and his charges this coming Saturday, when they head south to take on FC Bayern Munich in the classic Bavarian-Franconian regional derby. And if the odds certainly seem stacked in the hosts' favour going into it, coach Pep Guardiola, keeper Manuel Neuer and the rest of the star-studded Bayern ensemble will certainly have taken very meticulous note of Kiyotake's perfectly-flighted late leveller. The moment served to further underscore Wiesinger's take on his coveted 23-year-old playmaker after the previous four-goal thriller at 1899 Hoffenheim on Matchday 1. "He's our creative nerve-centre, we need him," said the 40-year-old tactician, who in tandem with Armin Reutershahn succeeded Wolfsburg-bound Dieter Hecking in the hot seat last December: "Kiyo has committed to us and he's enjoying himself at 1. FC Nürnberg. He had time to switch off over the summer and now he's fully charged up again." Charged up and evidently continuing to blossom at the heart of the action going into his second season in the German game, one with the added incentive of a place to be earned in Japan's squad for next summer's FIFA World Cup finals in Brazil. First things first, though, and with Nürnberg playing their fifth successive campaign in the Bundesliga for the first time in almost quarter of a century, they find themselves in the rare position of enjoying a fairly stable base to build from. Wiesinger himself has made no bones about the fact that "if we're still in the Bundesliga come the end of the season, everyone here will be satisfied." For him, the priority remains to "develop our own style and a brand of football that's right for us." A brand of football with Kiyotake as the linchpin, one of those versatile, fluid midfielders of the Japanese school currently enhancing the German game in ever increasing numbers. 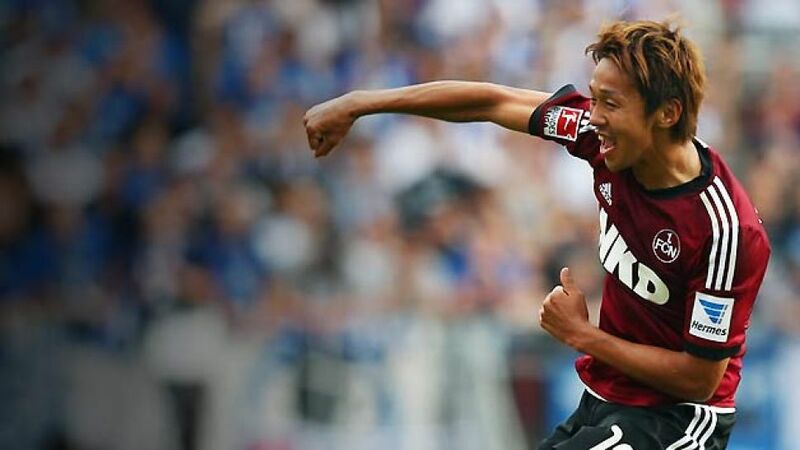 Affirming the coach's analysis that an extended holiday in the wake of Japan's participation in the Confederations Cup allowed him to "get a bit of distance from football and relax," the man signed last summer from Cerezo Osaka is looking to "improve again on last season" - where he chipped in with four goals and ten assists - and above all "perform consistently over the entire campaign." As far as that goes, Kiyotake has certainly got off on the right foot and it is that self-same magical right boot that the German and European champions will be keeping an exceptionally close eye on at the Allianz Arena this weekend.